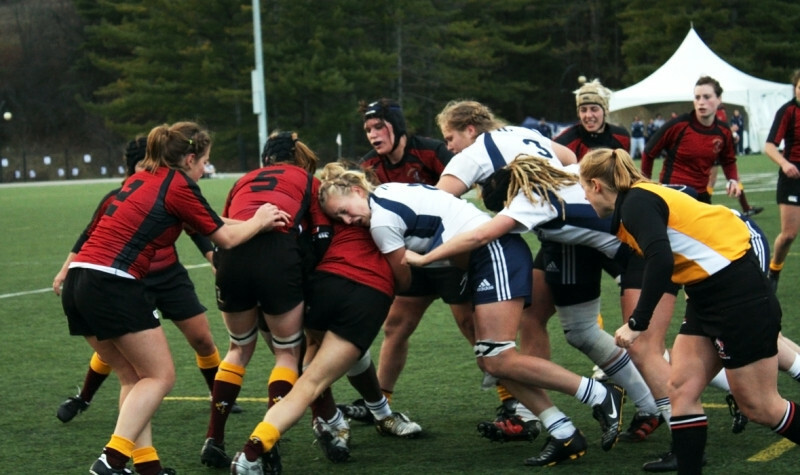 The Concordia Stingers women’s rugby team came up empty-handed in this past weekend’s Canadian Interuniversity Sport championships in Antigonish, Nova Scotia. This comes after shutting out the Queen’s Gaels 29-0, before being walloped by the hosting St. Francis Xavier X-Women in the Pool B semi-finals and the University of Alberta Pandas in the bronze-medal game. The Stingers came out shining in their opening game over the Gaels. After a slow first half, they came out swinging in the second, protecting the goal line and keeping the opposition off the scoresheet. Stingers prop Erika Ikonomopoulos got the ball rolling 10 minutes into the game when she barged the Queens goal line to go up 7-0. After halftime more tries would come from the Concordia side as three players marked the scoresheet including the game’s most valuable player and the CIS rookie of the year Bianca Farella, scoring two tries to help her team devour the Gaels 29-0. Unfortunately the momentum from Friday’s victory was halted when it came time for the semi-finals. The X-women earned an 11-0 lead before the game was 20 minutes old. “The easy part of the X game is that it got away from us early, so it wasn’t like we were going to come back,” said McGravie. This trend would continue for the rest of the half, and the game, the stingers finding themselves in a 23-0 hole at halftime. Fortunately the Stingers showed some life in the game’s 48th minute when Jenna Giuliani broke free from the X-Women defense before rushing the ball 40 yards into the opposition territory. They came close in the 53rd minute to getting on the scoreboard, but were halted by the defense on the scrum line. “The disappointing thing about the Alberta game was that we went up and they came back, and just as we were getting back into the game we let it slip away from us,” said McGravie. Unlike the semi-finals, the Stingers were able to make some ground before the Pandas took over. This is the case as both Cara Stuckey and Farella scored tries to come back within two points of the Pandas, who held a 17-15 lead with 20 minutes remaining. But Alberta woke up and scored 17 unanswered points to take the bronze medal. Despite not finishing in the top three, McGravie was happy with how his team progressed this season. “For this group of athletes, this is a special achievement. They did a great job and I’m super proud of them,” he said referring to the nine rookies in the nationals lineup.